Bear Archery is a company with a long-standing tradition in making high-quality bows, and, as you might expect, the Super Kodiak is part of what carries on the household name with pride. It must be said, right from the start, that this model is part of the brand’s traditional series, so it has a design that was first launched on the market in 1967. Tested by time, and embraced by hunters and shooters everywhere, the Super Kodiak is, without a doubt, an investment that may last you a lifetime. 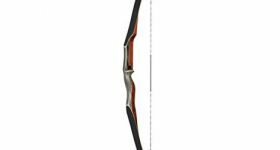 The result of the manufacturer’s dedication to creating the strongest and most accurate recurve bows on the market, the Bear Archery Super Kodiak is a gift you might like to reward yourself with, as a seasoned shooter. When it comes to durability, Bear Archery makes some of the toughest recurve bows available right now. The Super Kodiak comes with a strong build that will offer you years and years of use, without damage. The riser on this model is made from hard rock maple, and you will notice right away its high quality. The entire bow is polished, and the riser is designed with ergonomics in mind. As far as the limbs go, their tips are reinforced with fiberglass to ensure that you will enjoy the same durability and flexibility for years to come. You will not have to worry about splinters when you’re using this bow. As you look at the laminate construction, you will not be able to notice any bubbles under the laminate surface. That is just another proof of the superb craftsmanship invested by the manufacturer in this particular piece. For a recurve bow that costs several times more than the available cheap models on the market, you should expect at least a few elements of design that make this Bear Archery creation unique. And you would be right to think so, as the Super Kodiak proves that its name is a synonym to craftsmanship and attractive design. The arrow rest is covered in real bear hair, and the side plate is made of leather, which will instantly catch your eye. The overall design of the model is polished and states that the model you pick is of high quality. You will be pleased with the broad range of draw weights the model is available in, as that varies between 30lbs and 65lbs. 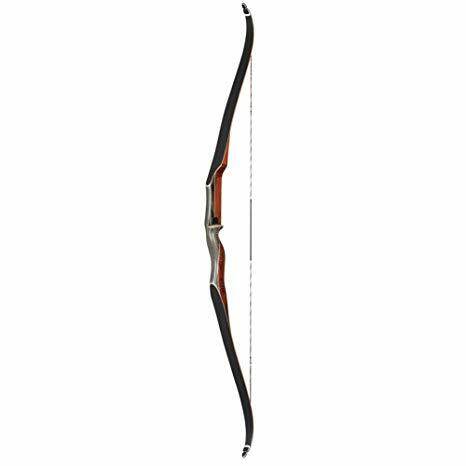 At 60 inches in length, it is comfortable to hold and shoot by most archers without a problem. There is one strong reason why you should consider the Super Kodiak for hunting. Its solid arrow rest will help you send your arrows with pinpoint accuracy toward your prey. The design of the arrow rest makes it durable and also acts as a great stabilizer, and, seeing that this model doesn’t allow the use of extra accessories, that’s a great plus. The Super Kodiak is resistant to bad weather, so you can safely carry it along with you on hunting sessions that require you to face such conditions. The Dynaflight 97 Flemish string that is delivered with your purchase will increase the value of this bow. You can expect the same high performance all around, and you won’t experience the same bad string mishaps as other shooters report for cheap recurve bows. You will be impressed with how smooth this bow draws and shoot. The high-quality string used helps with the overall performance and accuracy, as well. Overall, you will have a great experience when you’re shooting this bow, and the fact that it comes with a hefty price tag is justified. As expected from a model that is so much praised by the vast majority of people who have tried and tested it, this one is deadly and silent. You can get near your prey without worrying that drawing your bow will make the wildlife discover your position. If you’re looking for an ally that truly delivers, you will not go wrong with the Super Kodiak. Due to its high pricing, the Super Kodiak is not precisely for just any archer, and most certainly, it doesn’t sound like a model you would get for a beginner. But the array of features, as well as its overall craftsmanship and design, will convince you that there is hardly any better competitor on the market. The fact that the models in the traditional series from Bear Archery are sold with a limited lifetime warranty is proof enough of what you can expect from this particular model.